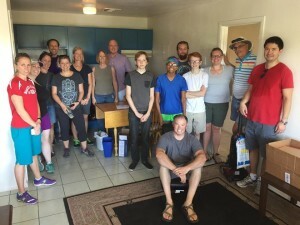 Tempe Community Action Agency (TCAA) offers the only shelter program available in the City of Tempe, the Interfaith Homeless Emergency Lodging Program, or I-HELP. Its goal is not only to provide for the immediate needs of homeless or displaced individuals, but also to offer them resources for finding employment and regaining self-sufficiency. St. Augustine’s collaborates once a month with the I-HELP program. On the fourth Friday of each month, St. A’s parishioners provide and serve a hot meal and a bagged lunch to those in need. Join us by contacting the office at saintaugtempe@gmail.com or by showing up at 4:30pm on the fourth Friday to serve! Teaming with Lutheran Social Services of the Southwest Refugee Services, we collaborate to sponsor refugee families in a variety of ways. From providing holiday gifts to furnishing the apartments of new arrivals, serving the needs of the most vulnerable is central to our understanding of the Gospel. Contact Anne Fornaciero for more information or to volunteer/donate. 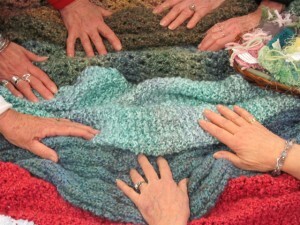 Shawls… Made for centuries universal and embracing, symbolic of an inclusive, unconditionally loving God. They warp, enfold, comfort, cover, give solace, mother, hug, shelter, and beautify. Those who have received these shawls have been uplifted and affirmed, as if given wings to fly above their troubles. Contact Cheryl Grimes for more information.